Toshiba Electronic Devices & Storage Corporation (“Toshiba”) today announced its new MQ04 Series 2TB HDD model MQ04ABD200, designed for use in notebook PCs, all-in-one and slim-line desktop systems, and other applications requiring high capacity storage and 2.5-inch mobile-class durability. The MQ04ABD200 dual-disk model delivers 2TB of storage capacity in a compact 2.5-inch, 9.5mm height form factor. The drive’s 6Gbit/s SATA interface and 5,400rpm performance, combined with a large 128MiB buffer, result in a 34 percent increase in maximum transfer rates and a 50 percent improvement in power efficiency compared to Toshiba’s previous 1TB mobile-class model generation, MQ01ABD100. General availability of the MQ04 2TB model shipment will start today. 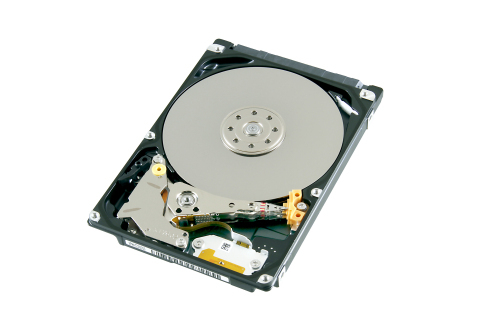 Form Factor: "2.5-inch" means the form factor of HDDs. They do not indicate drive's physical size. Power efficiency is calculated based on low power idle power consumption divided by formatted capacity.